The years 1941 through 1950 make up the 195th decade A.D. and the first decade of my life. 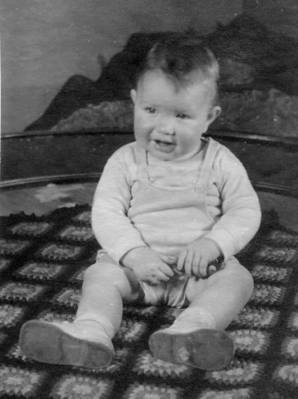 1941 - I was born February 11, 1941, in the St. Vincent Hospital in Little Rock, Arkansas, to James Arthur Skipper, Jr. and Eva Louise Maxwell Skipper. She was just six days short of her 21st birthday and he was 19 years and 3 months old. Her parents were Luther Alonzo Maxwell (49) and Eugenia Francis Houston Maxwell (42). 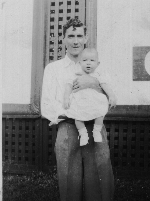 His parents were James Arthur Skipper, Sr. and Mayola Josephine Noland Skipper, both deceased. She was an only child and he was the fourth of five children and the middle of three sons. She was born and raised at Lanty in Conway County and he was born and raised at England in Lonoke County although his father was born and raised at Lanty. James and Louise met at the Arkansas State Teachers College (now the University of Central Arkansas) in Conway. His sister, Pauline, who was one year older than he and also attending ASTC, may have introduced them. Momma was working as a 'nanny' to help with her room and board. We have a short movie clip of her and the little girl she cared for. My sisters told me recently that after Daddy and Momma were first married, Momma stayed with the family to complete her semester studies and would not sleep in the same room with Daddy when he came to see her because she was too embarrased. They were married in November 1939 just eight months after his mother died. 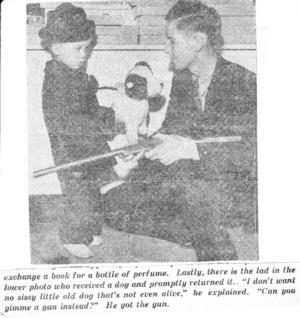 They moved to the apartment in Little Rock February 4, 1940, as reported in the newspaper article here. Click the article to see a readable version. The town of Solgohachia is mentioned because that was the Maxwell's mailing address and because of its Indian connection. It is the town where Dad's father served his first term as postmaster from 1908 to 1912. Dad's father died of a stroke five days after they had moved to Little Rock. For several months they kept James' little 10-year old brother, Joe Noland Skipper. Dad continued to work at the Sterling Store where his older brother, Irving, worked. The next newspaper article shows him posed at his job. After I was born, they sent Joe to stay with either Irving and his wife, Nila, or with Dad's older sister, Thelma, and her husband, Coleman Edgeworth. Momma said she just couldn't handle a new baby and a rambunctious 10-year old at the same time. These photos were probably taken in March or April of 1941. 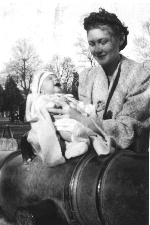 A young couple out for an afternoon in the park with their newborn son. The location is MacArthur Park in Little Rock near where we lived on Rock Street. On a recent trip to Arkansas, I looked for the cannon, but couldn't find it. But in "Around Little Rock - A Postcard History", which I bought at a garage sale in Arkansas, I found a photo of the cannon a description explaining that it had been melted down to supply brass for the war effort. The 12-foot cannon had been forged in Spain in 1796 and had been captured in Cuba during the Spanish-American war of 1898. The next two photos must have been made a little later in the year. I can imagine a couple out alone without a 'self timer' on their camera taking pictures of each other holding their baby in turn. 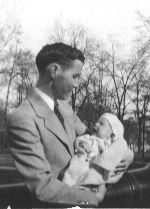 On November 7th 1941 my Dad had his 20th birthday. On December 7th, the Japanese bombed Pearl Harbor and the United States entered the war in the Pacific. 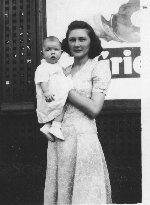 I was almost one year old and Momma was almost 22.